19-Aug-2017 -- “It’s less than a mile hike”, I said to Jerry when I asked him if he was ready for another adventure several months before our actual visit. He readily agreed before I even was able to tell him that the hike involved a climb of over 1,200’ vertical up a very steep slope, then scrambling 150’ down a significant scree slope possibly requiring ropes. I had already put out an invite to Ross Finlayson. The developing plan was to visit this remote confluence before or after the Total Solar Eclipse on 21 Aug 2017. As it got closer, we agreed to meet and attempt to visit this confluence on the weekend before the eclipse. We had come from 43N 112W the day prior and met Ross at the start of North Creek Road and continued five miles east with a 1,300’ change in elevation until we parked here just outside the Targhee National Forest in a pull out south of the road and prepared to continue up the North Creek Trail on my Polaris RZR. GoogleEarth identifies these trails as 194 then 151. There were three of us and a two place RZR. This would require a couple of trips to leap frog to the start of the hill. I decided to take Ross up first with his DJI Mavic drone so he could get some video of the area while I went back to pick up Jerry and then get drone video of Jerry and I arriving. It was only 3.3 miles and 1,200’ up along a trail more suited for a narrow ATV instead of a wider SxS but it was a fairly quick trip up. I dropped Ross off and went back to pick up Jerry. When I got back to the staging area, Jerry told me I had a flat tire – it had some significant damage but we were able to quickly change it and head back up to where Ross was waiting. You can watch highlights of the trip to the base of the hill on video from the RZR here. Be gentle – I was using GoPro Quik for the very first time and it was my first attempt at a movie – it puts highlights onto a 60 second video. This climb was going to be quite strenuous! It looked just like the GoogleEarth depiction, except at a much larger scale and I couldn’t just scroll my mouse around the terrain! The first and only previous visitors, Dave Atkinson and Bill Bauer, were here over 17 years ago. Their narrative was helpful in our planning. Using the 3D visualization and navigation tools in GoogleEarth Pro and its recent high resolution imagery suggested that the path of least resistance would be to follow a visible path up the spine of this ridge and then descend to the confluence on the steep scree slope, tree cluster to tree cluster. We had brought 250 feet of rope to use as a hand hold that we would end up using for part of the descent and return back to the top of the ridge from the confluence. It took just under two hours to reach the confluence. Picture 9 reveals that it was a 28 degree slope up the spine. Somewhere near the top we started to proceed direct to the confluence along the scree slope while Jerry continued up to the top of the ridge. He tied the rope off on a large tree a short way down and used it as a safety hand hold that we would find very useful on our climb back to the top of the ridge. Ross reached the confluence first at the base of a tree (Picture 6) that also provided a relatively flat area to sit. 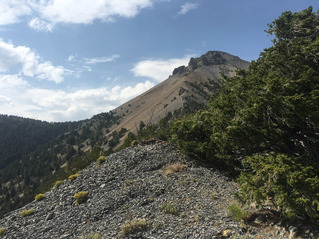 It would have been extremely difficult to remain stationary if the tree wasn’t there because the scree was flat with sharp edges and resting at the angle of repose – any movement on it resulted in a slide downward. The slope of the westward facing slope was even greater than the slope of the spine we had climbed. We ate some trail mix while we recovered from the hike up. We briefly considered going down the slope but quickly determined that was not a safe plan since it would be impossible to stop if you started to slide down – and it was over 1,000’ vertically to the base of the slope. The views in all directions were incredible but smoke from several distant fires added some haze that increased throughout the day. Our hike down was much faster and after we reached the RZR we decided to have Jerry climb on the storage box in the back and make a single very slow descent back to our vehicles since we no longer had a spare tire. Total time on our hike was just under four hours. The hike itself was only 0.7 miles with almost 1,200’ elevation change. Total time from the time we parked to the time we were on our way back was six hours. Picture 1 looks north towards a 10,600’ unnamed peak from the top of the ridge (9,000’) which is still within 100 meters of the confluence. Picture 2 looks north from the confluence (8,830’). Picture 3 looks back towards the safety of the weathered confluence tree. Picture 4 looks south down the valley. Picture 5 looks west across the valley. Picture 6 shows a fisheye view of the successful confluencers. Picture 7 looks southeast with Tyler Peak in the background. Picture 8 looks down the spine at the start of our descent. The trail coming up the valley is clearly visible. Picture 9 looks back up the spine following our descent (7,780’), it’s a steady 28 degree incline for over 1,200’ up! Picture 10 looks northeast from where we parked and the valley that we would go through. Picture 11 shows the RZR tire damage from the sharp rocks. Picture 12 shows the differentially corrected position. Post processing of the GPS data (958 positions) reveals that my Trimble GPS receiver was 4.378 meters bearing 026 degrees from the actual confluence with a Horizontal Precision of 2.8 meters. This confluence is definitely in my top 10 of challenging and worthy confluences! Our adventure continued the next day at 44N 114W. #9: Bottom of ridge looking up trail. Theolodite app reveals a 28 degree incline!